Expect the University of Louisville football team to have a better offense this season without Lamar Jackson, winner of the Heisman Trophy and the player who rewrote the record books in three seasons at UofL. That’s coming from Coach Bobby Petrino who, while he would never acknowledge it, had limited options on offense, especially the past two years. 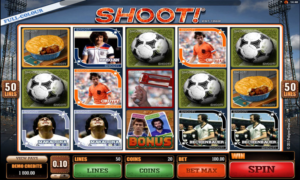 It was no secret that the offense revolved heavily around the abilities of one player. It was Lamar Jackson this, Lamar Jackson that, this way, that way, through the air, on the ground. Not much imagination on offense, not much guesswork on defense. Everybody knew what was coming. Lamar Jackson all the time. 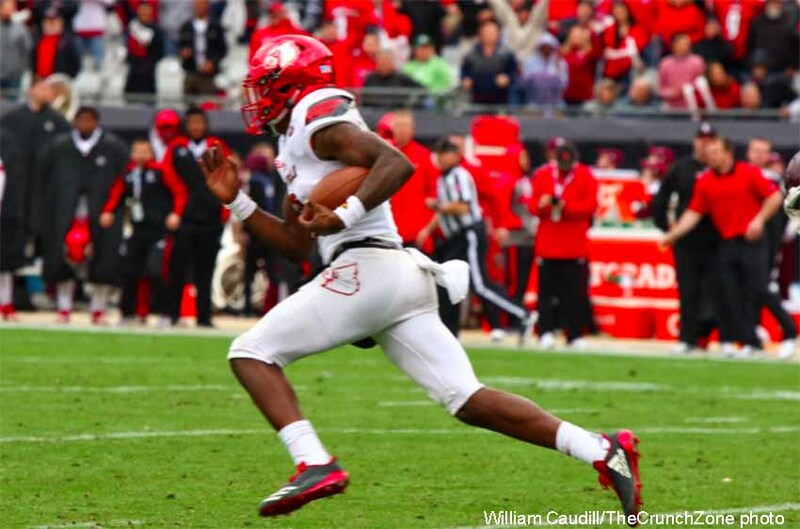 The UofL offense bore little resemblance to Bobby Petrino’s offenses prior to the Lamar Jackson era. Probably for a couple of reasons. Jackson may have never really mastered Petrino’s playbook. Jackson even admitted he didn’t know the plays after his freshman year. He was still setting offensive records at a sizzling pace so Petrino had little option but to turn Jackson loose. Jackson was far from perfect at crunch time. As good as he was, Jackson often had trouble maintaining possession, fumbling an inordinate number of times and giving up interceptions. Between the turnovers, though, he was extraordinarily gifted. 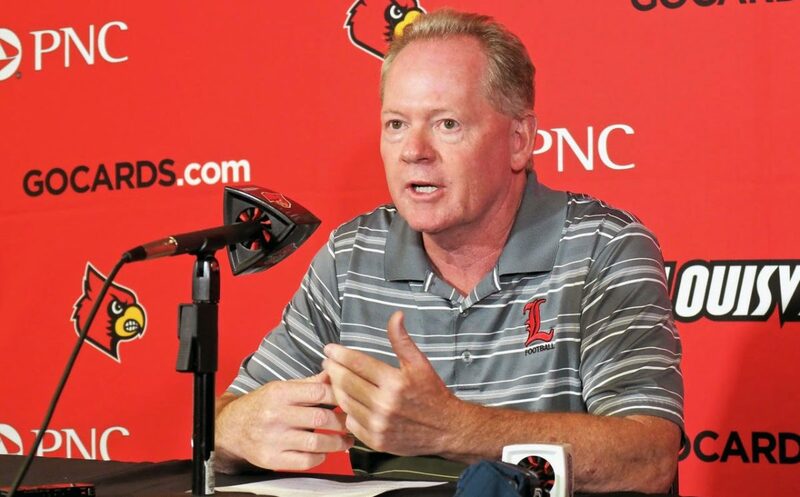 Petrino also believes the running backs will be more of a factor again. “The running backs are a good group” he said. “Tre Smith had a great spring. He really showed his ability to run between the tackles and get yards after contact and protect the quarterback. Watch for UofL to look more like the typical Petrino team during the upcoming season, with a more traditional quarterback in Jawon Pass. The 6-foot-4 sophomore was a consensus four-star prospect out of Carver High School in Columbus, Georgia. More talent all around is what Petrino is saying. More of a multi-dimensional approach with more of the right people involved at all the key positions. 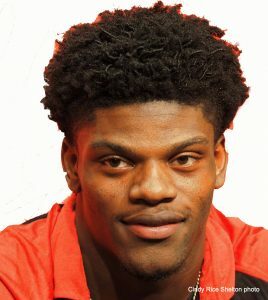 Lamar Jackson was an incredible athlete, entertaining and fun to watch, and he will be missed. Back to the basics now, spreading the wealth around, with more of a team approach, hopefully making Louisville more competitive in the immediate future. Over-reliance on any one player, however, is never a good thing. 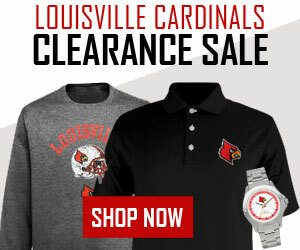 Probably the best thing for Jackson and the University of Louisville football program if he decides soon to pursue a career in the National Football League. Almost impossible for Jackson to live up to massive expectations. Every sensational play, every pass completion, every dazzling run, every touchdown making him indispensable to his team. If Jackson wasn’t involved, it wasn’t going to happen. 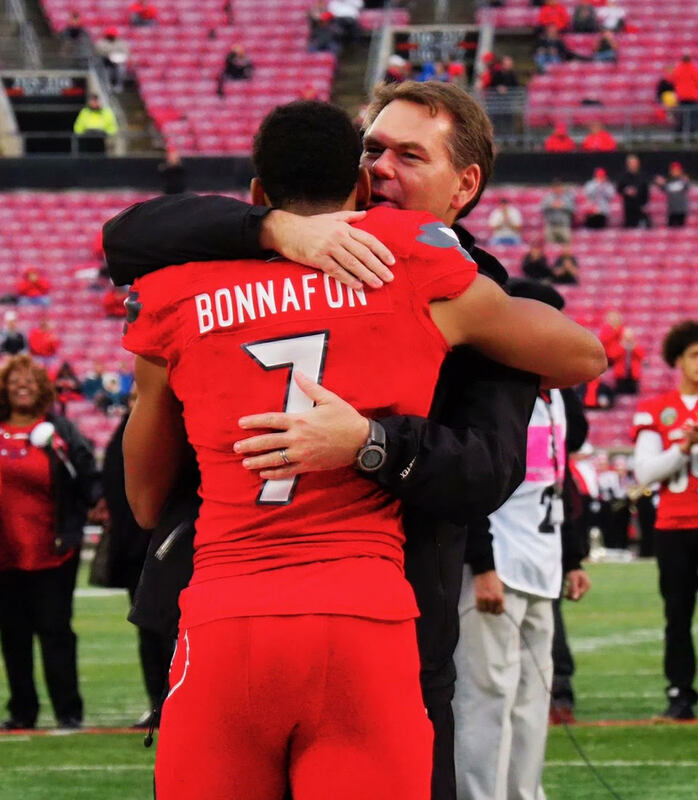 Coach Bobby Petrino, getting away from the offensive strategies that have worked well for him in the past, was overly dependent on the instincts of one player. UofL’s success, or lack of it, may have suffered as a result, with little evidence of progress in the team’s overall development. 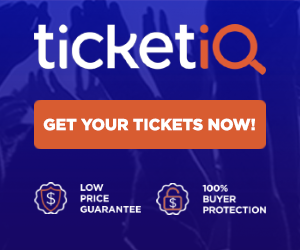 When Jackson was having a off day or not getting enough protection, he was prone to making major mistakes as he was Saturday when he threw four interceptions in the 31-27 loss to Mississippi State in the TaxSlayer Bowl in Jacksonville. It got to a point where some fans closed their eyes when he dropped back to pass. A fifth interception seemed inevitable. He completed 13 of 31 passing attempts for 171 yards with a passing efficiency mark of only 47.4% for the game. Jackson gained 158 yards on the ground, including a touchdown, on 24 carries, not wanting to give up the ball to his running backs. Possibly for good reason with Malik Williams, Reggie Bonnafon, and Dae Williams combining for only 29 yards on 15 chances. Bonnafon, a senior, was one of those teammates who never quite lived up to his potential. He finished the final game of his career with 13 yards rushing. He was never a real punt return threat, gaining nine yards on his only return Saturday. Jackson has created some incredible memories for fans over the past three seasons. Time for him to move on, however, time to focus on the his future in the NFL. 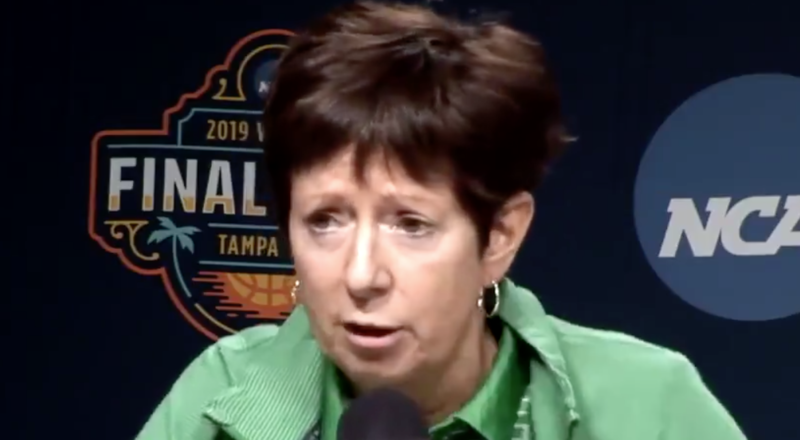 UofL needs to move on as well, focusing on the team’s total development, getting everyone involved, and seriously competing again in the Atlantic Coast Conference. 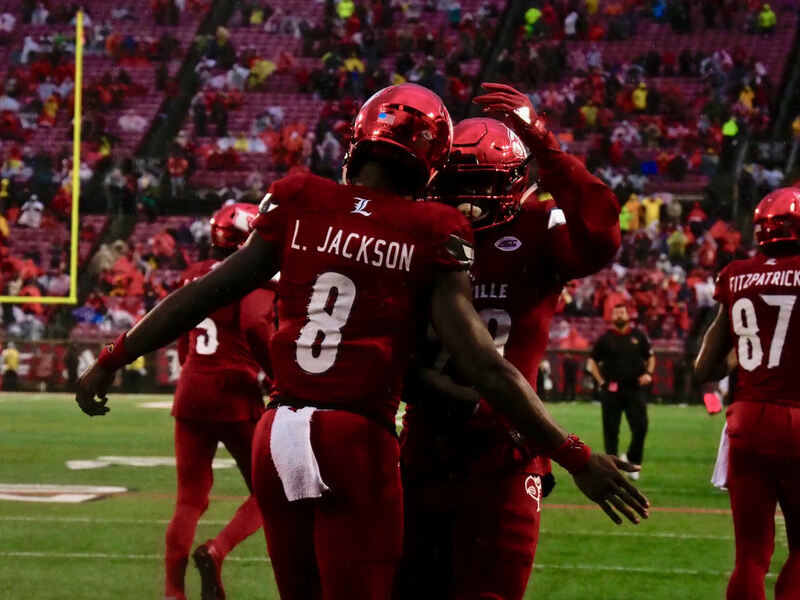 Quarterback Lamar Jackson and Jaire Alexander embrace after hooking up on a 72-yard touchdown pass play in the second quarter (lead photo). Stormy weather (above) but not the terror the TV weather guys were forecasting (Cindy Rice Shelton photos). 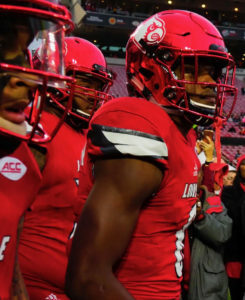 Lamar Jackson prepares to enter Cardinal Stadium for what was what probably the final home game of his career at the University of Louisville (Cindy Rice Shelton photo). 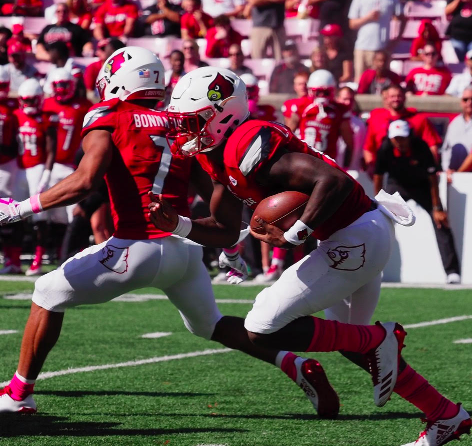 Nothing could have come close to the scary weather predictions made by Louisville’s TV forecasters during the days leading up to the UofL-Syracuse football game. A possible storm of the decade it seemed and it was going to be confined to Papa John’s Cardinal Stadium. The first thing to remember is that wind, rain and/or snow make for great football, creating great memories for the players and fans. The second is that the forecasts are going to be exaggerated, never matching the intensity of the people making them. 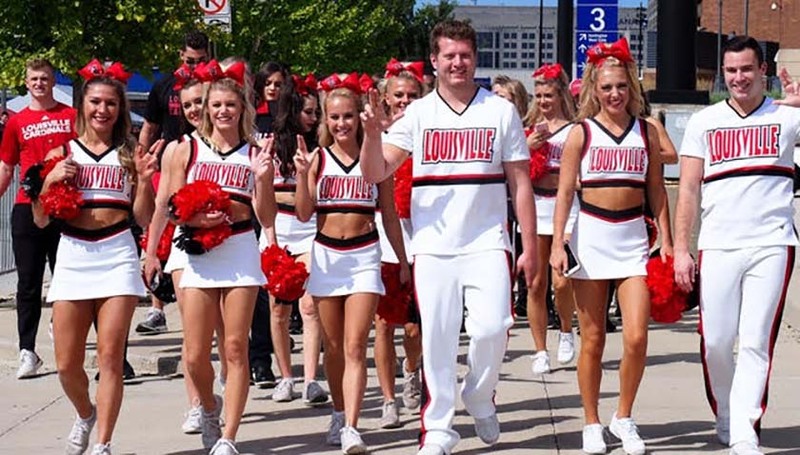 As a result lots of loyal UofL football fans were scared off Saturday, not venturing out of their comfort zones. Amazing that some 34,265 were there to enjoy one of Louisville’s most dominant games of the season, a 56-10 win over Syracuse. Lamar Jackson is the first to congratulate Malik Williams on his 46-yard touchdown in the first quarter (Cindy Rice Shelton photo). Nothing special, Cardinal fans have seen much, much worse. 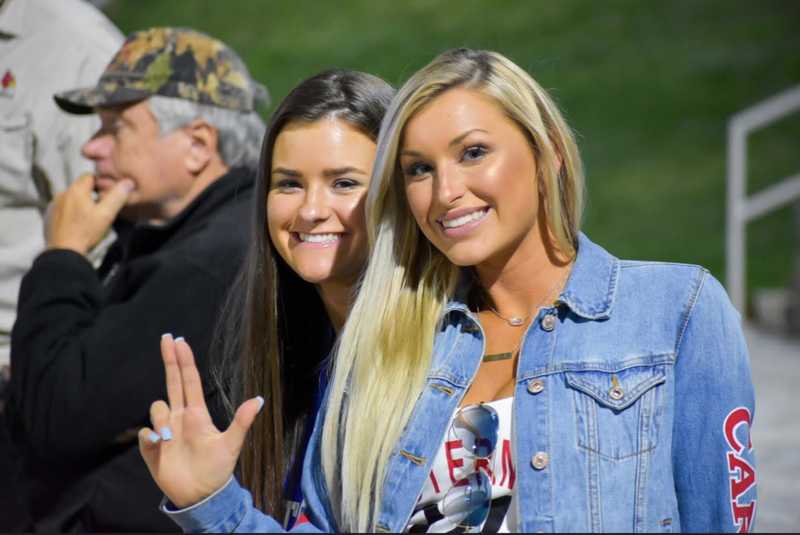 The most loyal, the ones who chose to endure the elements, were rewarded Saturday with the honor of seeing what may have been quarterback Lamar Jackson’s final home game at PJCS. Just another in many big games for him — 230 yards and two touchdowns through the air and 120 yards and two more touchdowns on the ground. Lamar Jackson earned legendary status during his three seasons at UofL. All the numbers, all the touchdowns, all the memorable moments, probably never to be repeated again by anyone anywhere. Absolutely impossible to exaggerate all that he has accomplished. Senior running back Malik Williams, happy to be taking the ball from Jackson, having his best game ever in his final home game — 180 yards rushing, including two touchdowns, including a 46-yard TD on the second play of the game, and a 56-yard run on another play. Reggie Bonnafon getting a hug from Interim Athletic Director Vince Tyra during Senior Day ceremonies (Cindy Rice Shelton photo). Senior Reggie Bonnafon, also playing in his last game at PJCS, continuing to play wherever he was needed, today as a running back and kick returner. He would score two touchdowns in the second quarter — his first on a 33-yard, the second on a 34-yard pass from Jackson. 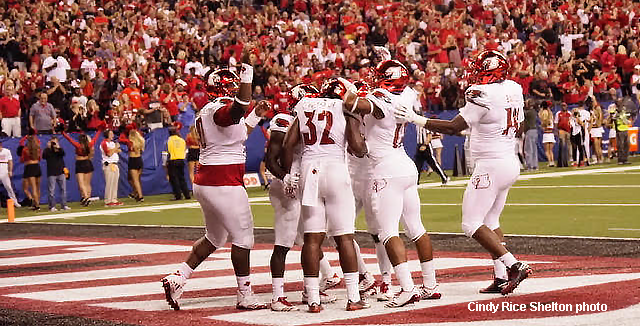 What a performance from the UofL defense, holding Syracuse to 197 yards rushing and 138 yards passing. Freshman Dorian Etheridge in on 11 tackles, including five solo’s. Senior linebacker Stacy Thomas and freshman C.J. Avery in on seven tackles. Make a note and look ahead, two freshmen for 18 tackles, more to come. 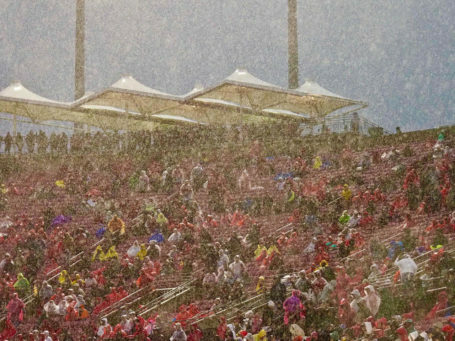 Such an enjoyable game to watch, having learned over the years how to survive the elements at Louisville football games. Great to see the defense emerge from invisibility to becoming an effective force. Nice to once again pummel Syracuse, one of those schools that would have left UofL in a lesser conference. We’ve run out of football Saturdays again in Louisville, they always seem to go so quickly. Especially when the Cardinals are playing like they were the last two games. Louisville’s defensive line needed lots of help from linebacker Dorian Etheridge (17). He would make nine solo tackles and get five assists (Cindy Rice Shelton photos). Wide receiver Jaylen Smith finally back in action, with 118 yards on six catches. Wide receiver Dez Fitzpatrick as good as ever, turning seven catches into 127 yards, including a touchdown. Running back Reggie Bonnafon actually breaking loose for a 64-yard touchdown. 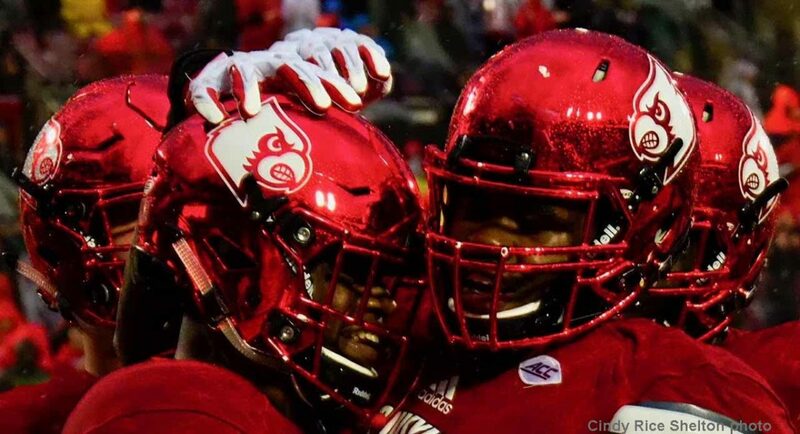 Lamar Jackson tossed for three touchdowns and ran for two others (Cindy Rice Shelton photos). 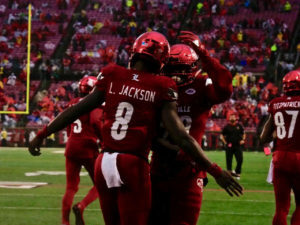 Quarterback Lamar Jackson living up to his reputation, with more amazing stats, including 181 yards and three touchdowns rushing, 323 yards and two touchdowns passing. Some nice offensive stats, just not enough of them. The University of Louisville’s offense could still be putting up points but there would never be enough. The defense was incapable of stopping Boston College, the Cardinals losing 45-42 in a three-ring offensive circus before 44,679 at Papa John’s Cardinal Stadium. UofL’s defense remained as porous as always, seemingly unable to stop anyone on the first tackle attempt, usually on the second or third attempt. Not a pretty picture, foreshadowing visions of even more dismal performances in the weeks ahead against stronger opponents. 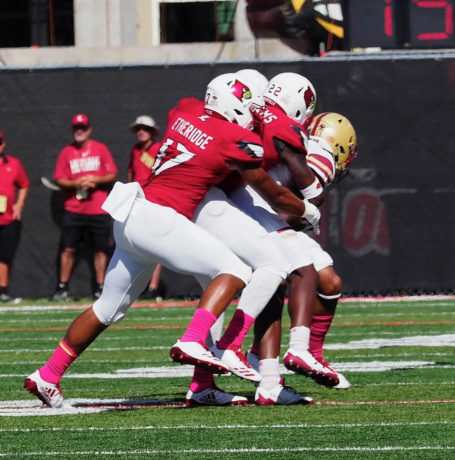 The exception was UofL linebacker Dorian Etheridge, the 6-foot-3 freshman winding up with nine solo tackles and five assists. Jaylen Smith’s joyous return would be spoiled by a fumble following a catch with less than two minutes remaining at UofL’s 30-yard line. Just a matter of time, Boston College wasn’t going to be denied, converting a 27-yard field goal for the win in the closing seconds. Boston College’s first Atlantic Coast Conference win since 2014, Louisville’s third ACC loss in four games this season. More than likely, it’s going to get uglier before it gets better for UofL football. Prepare yourself. 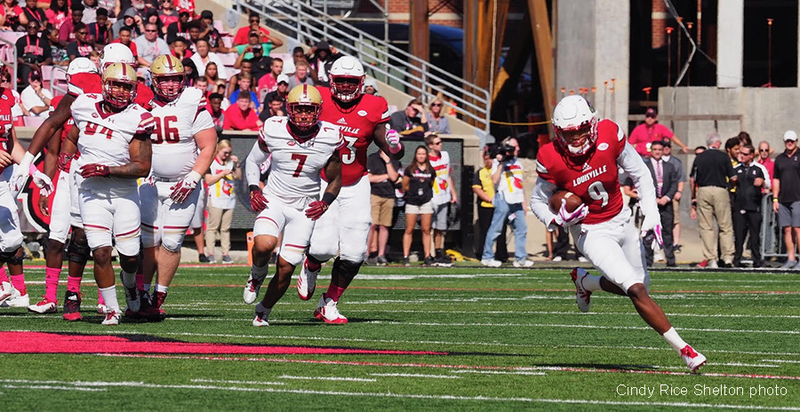 Stacy Thomas turned momentum in Louisville’s favor with a 61-yard touchdown after an intercepted pass in the third quarter (Cindy Rice Shelton photos). Football is supposed to be an entertaining game but the University of Louisville’s 35-28 win over Purdue was everything but fun. 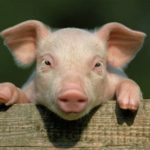 Hard to watch when so many things are going wrong, afraid of what’s going to happen next. The false starts by the offensive line, becoming almost predictable by the third quarter, backing UofL up much of the night. This from what was expected to be a much-improved, albeit inexperienced at key positions. Ten false starts, surely a record for edginess, almost obscuring any progress on this front. Video replay confirmed that Reggie Bonnafon scored on a 10-yard jaunt in the third quarter (Cindy Rice Shelton photo). On the other hand, the young offensive line would not allow Purdue a single sack, a positive sign compared to late last season when the sack count sometimes approached double digits. If visions of past fumbles came to mind on the opening drive, it was good reason. Quarterback Lamar Jackson lined up on the Purdue 3-yard line, coughing up the ball on his very first series of the season. No quick touchdown on the opening drive, fumble-itis was back, UofL turning the ball three times in the game. Jackson still needing to provide the bulk of the offense, getting little help in the running game from Reggie Bonnafon and Jeremy Smith who managed only 33 yards between them. He would rush for 111 yards and complete 33 of 46 passes for 378 yards and two aerial touchdowns. The offense struggling to keep Louisville in the game. Opposing coaches possibly figuring out how to contain Jackson much of the time. Or was it because Purdue Coach Jeff Brohm knows Petrino’s offense almost as well as the UofL coach? Probably a combination of both. UofL’s other All-American candidate, cornerback Jaire Alexander, would be injured early in the second quarter and would not return to the game. His teammate Stacy Thomas would come through with a 61-yard touchdown on an intercepted pass in the third quarter. 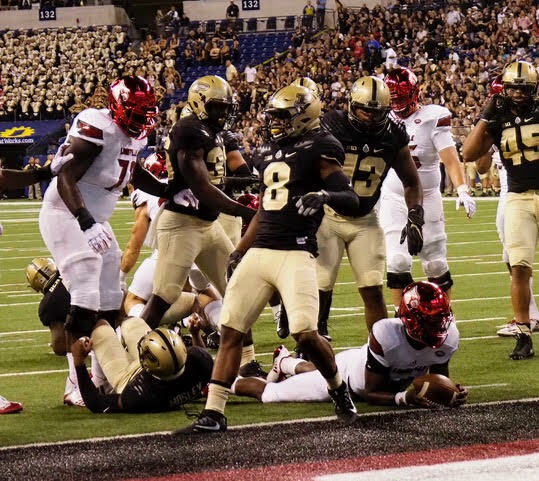 Chucky Williams would pick off another Purdue pass in the end zone. Painful game overall, however, irritating until the end. A painful reminder that 27-point underdogs are never as bad as they should be, especially in the first game of the season. Especially against a bunch of Brohm boys from Louisville. The Cardinals need to make significant progress between their first and second games to be taken seriously this season. No getting off to a great start, no big first impressions. No early thoughts about college playoffs. UofL tailgaters were out in force at Lucas Oil Stadium (Cindy Rice Shelton photo).